The E-Vone footwear is designed for older adults and construction workers. 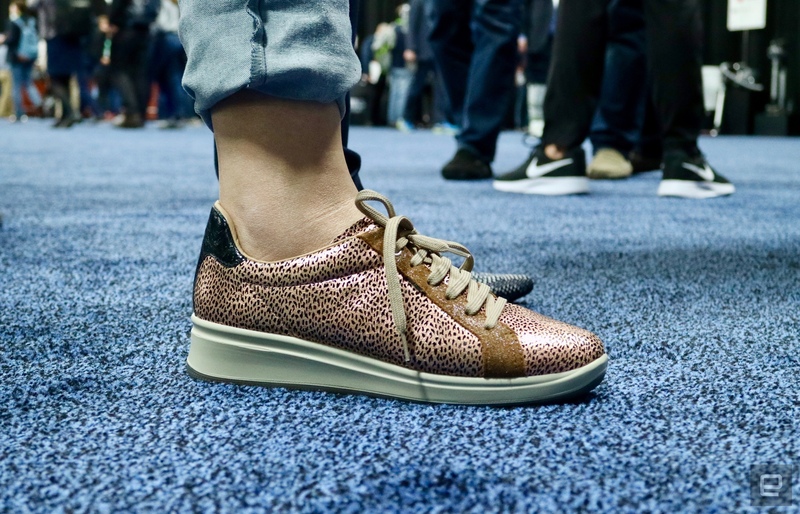 We've seen our fair share of smart shoes at CES in the past, including a pair you can "lace up" using your smartphone. And today, at CES, we came across some more interesting footwear. What you see above are the "smart shoes with falling alert," created by a French startup called E-Vone. As the name suggests, the kicks feature a system that will notify friends, family or medical services if the person wearing them happens to take a fall. The company says they're designed for older adults (like your grandma or grandpa), as well as construction workers, hikers or anyone who feels like they may require assistance if they're alone indoors or outdoors. Inside E-Vone's shoes, specifically the midsole, there are a slew of sensors: GPS, accelerometer, gyroscope and a pressure system that knows every time someone put on the shoe on and activates the alarm. According to E-Vone, they don't need to be paired to a mobile device because the shoe processes all the information on its own, thanks to a GSM chip, GPS and LoRa antennas, which can send the bad news with "ultra-precise" geolocation details. Unfortunately, none of the sample pairs being shown here at CES aren't working prototypes, but an E-Vone rep said we can get a demo in the next few days. The shoes are said to be available in about six months, with pricing expected to be between $100 and $150, plus $20 per month for the alarm service. We're told there will also be an option to just pay $30 per month and nothing up front. The company adds that it aims to launch the shoes in the US in the near future, but didn't provide a specific date.